Posted in Misc and tagged nickelback at 11:19 am on September 28, 2015 by Broadsheet. Between this, the crap cartoons and dull as dsihwater poetry BS is not lifting me out of my Monday Blues! She lays eggs for gentleman. Not for ladies, how absurd! I’m so happy I clicked this link. Nickleback might be awful but they’ve still done more than anything this attention seeker will in music. Nickelback are actually a really competent rock guitar. Not saying that their ‘art’ is up to much but they’d shred an decent pub band to pieces…. 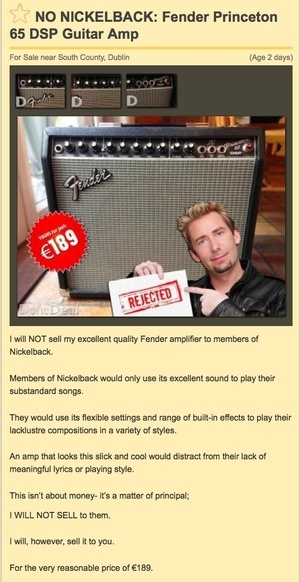 Nickelback are actually a really competent rock band. Hope that sticks in yer head all evening. My other half got in a fist fight on the nightlink once over Nickelback and how poo they are. He was quite passionate about it.